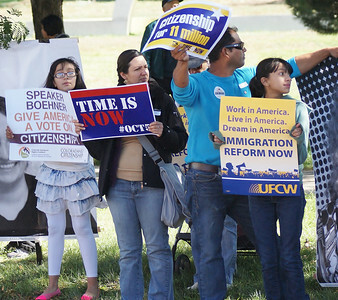 Group of people waving immigration reform signs on street corner at rally. 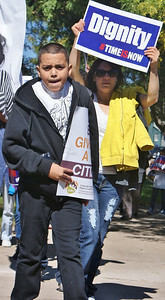 Young hispanic boy, holding sign and chanting in immigration reform march. 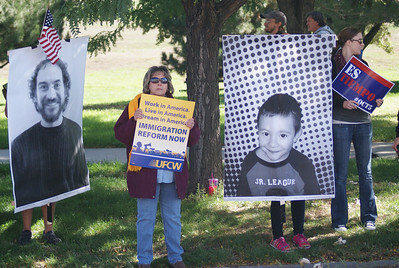 Hispanic woman and young boy at immigration reform rally. 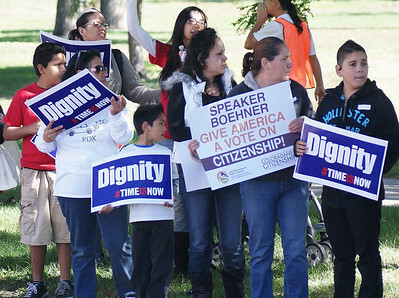 Two hispanic women and young boy at immigration reform rally. 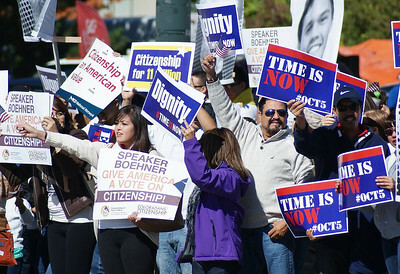 Crowd of people raising signs above their heads at immigration reform rally. Shot from behind. 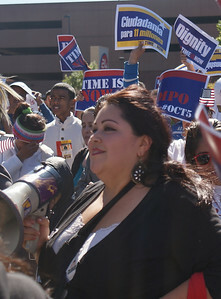 Hispanic woman holding megaphone at immigration reform rally, large crowd behind her. 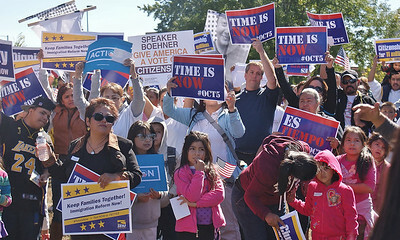 Crowd of people, including young children, raising signs above their heads at immigration reform rally. 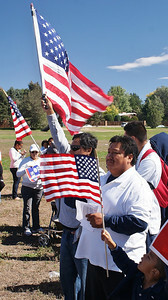 Group of hispanic men holding American flags at immigration reform rally. 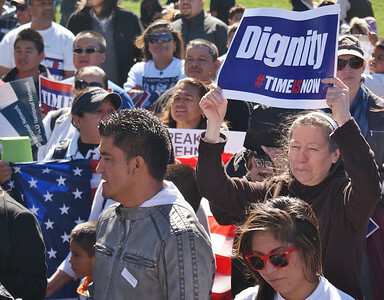 Woman raises sign above her head at immigration reform rally, crowd of people around her. 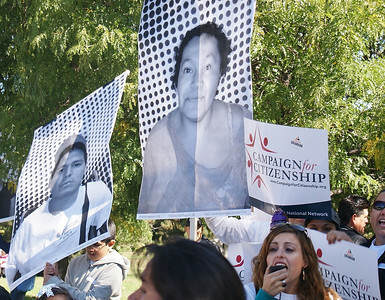 Young hispanic girl in immigration reform march. 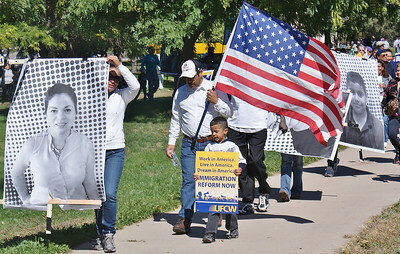 Union member carries pro immigration reform sign in march in Denver, Co.
Man carrying sign in immigration reform march, shouting. About 800 people rallied for immigration reform at Burns Park in Denver, Co, on Sat 10/5/13. 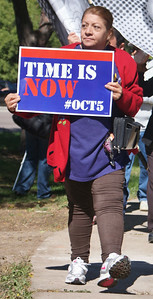 Hispanic woman holding sign, in immigration reform march. 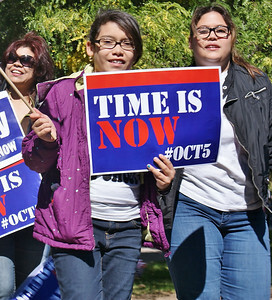 Young hispanic girls at immigration reform march. 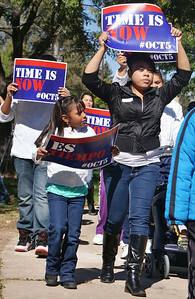 Two young hispanic girls hold sign at immigration reform march. 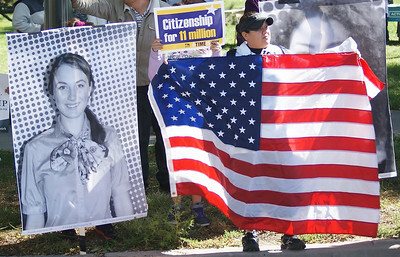 Young girl with sign in immigration reform march, woman with American flag beside her. 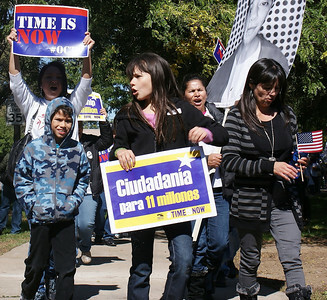 Hispanic man and woman hold signs in immigration reform march, young boy next to them. 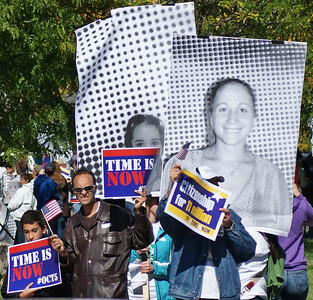 Young woman in immigration reform march with sign, man with Statue of Liberty sign, behind her. 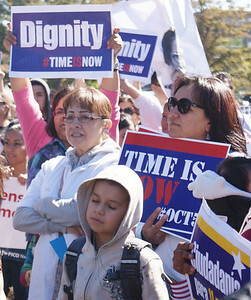 Hispanic woman holding hand of young boy, at immigration reform march. 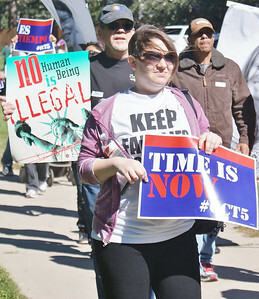 Woman holding 2 signs in immigration reform march, other marchers behind her. 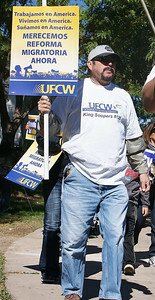 Hispanic man carries young son on shoulders at immigration reform march. 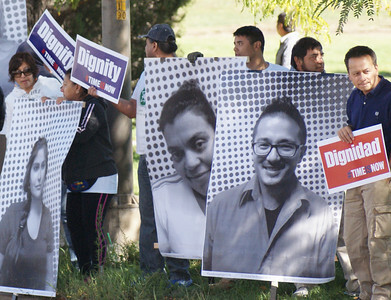 Two hispanic men with signs in immigration reform march. 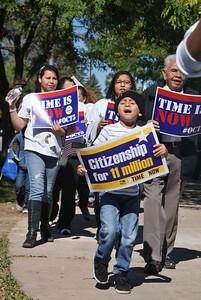 Hispanic father carrying large American flag, young son beside him, in immigration reform march. 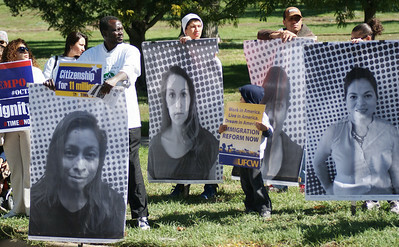 Marchers with large poster sized pictures in front of and behind them. 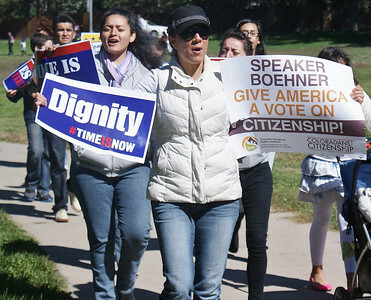 Demonstrators line street, holding signs, at immigration reform rally in Denver, Colorado, 10/5/13. 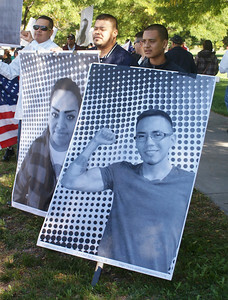 Hispanic men display large picture/posters at immigration reform rally. 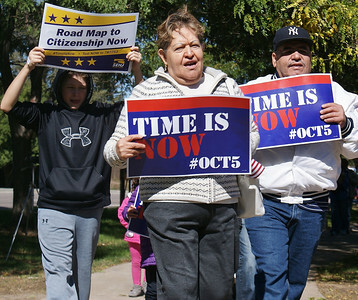 Denver, Colorado 10/5/2013. 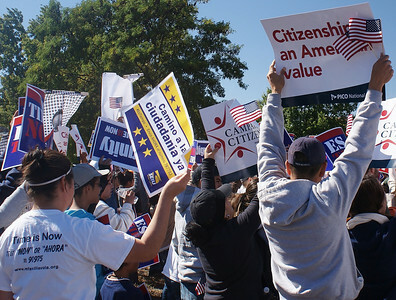 Man waving small American flag at immigration reform rally. Small boy next to him. Large poster pictures behind them. Hispanic woman speaking into micrphone at immigration reform rally. Three young girls in front of her, large poster photograph behind her. 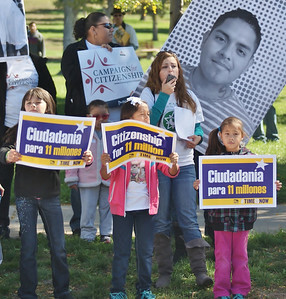 Immigration reform protester hold signs, including large picture posters, at rally in Denver. 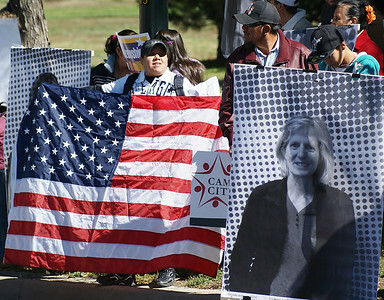 Woman at immigration reform rally holds large American flag. Large poster sized phograph, next to her. 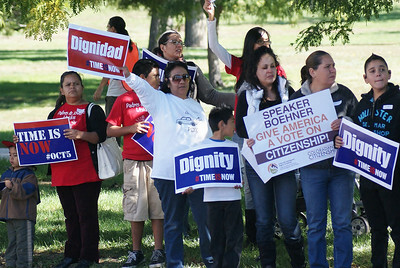 Woman at immigration reform rally holds large American. Large poster sized phograph, next to her. 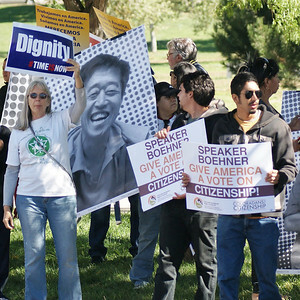 Group of people at immigration reform rally holding citizenship signs. Large picture poster behind them. 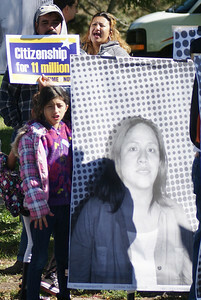 Young hispanic girl standing next to large poster photograph, at immigration reform rally. 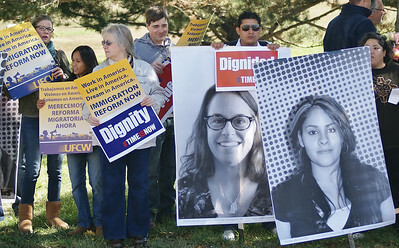 Woman displays immigration reform sign, flanked by 2 large picture/posters of immigrants. Denver, Colorado 10/5/13. 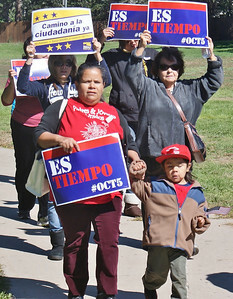 Hispanic family, including young children, holding sign at immigration reform rally. 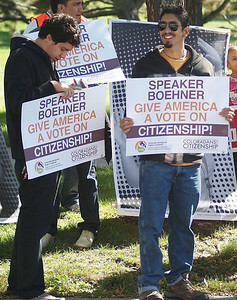 Two young hispanic men hold signs advocating citizenship, at immigration reform rally. 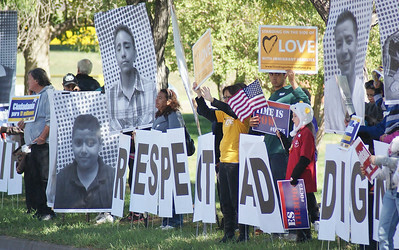 hispanic women and young children, display immigration reform signs at rally in Denver.